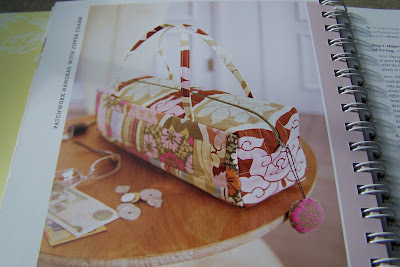 I have owned Amy Butler’s “In Stitches” for some time now and thought it would be fun to try a quilted box bag. I selected the “Patchwork Handbag With Zipper Charm”. I thought it would be a good use of scraps and a fun first quilting project. The project requires a number of pieces of main fabric, lining, backing fabric and batting. The main pieces and lining could be cut from 1/2 yard or less of fabric. I had the luxury of selecting color coordinated scraps from the scrap bin at Contemporary Cloth. But you could use your stash or try your luck with one of the scrap bags. The pattern calls for making a cardboard insert for the bottom of the bag. I simply couldn’t see how this would make the bag sturdy enough – at least for my taste. 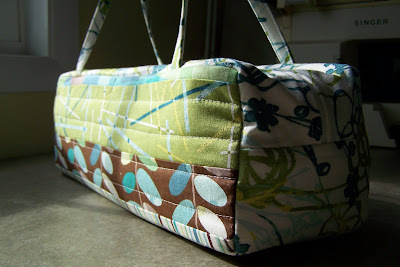 So when making the lining, I attached Timtex, a fairly sturdy sew in stabilizer, that is great for bags and totes. This added wonderful shape to the bag – so much so that I did not need to add the cardboard. Even after adding my wallet and several other items the bag held its shape. Overall, I’m very pleased with the bag. I learned how to make a box-shaped bag. And next time, I will be a bit more adventurous in my quilting! Your bag turned out so pretty. I like that brown fabric with the blue circles. I don’t sew or quilt, so it all sounds very complicated to me. 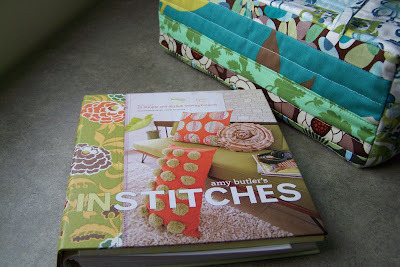 I love that book, I have yet to make a project out of it, but your bag is beautiful, good work!!! 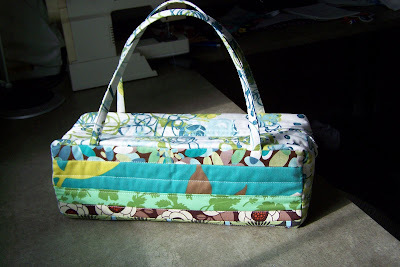 I love the fabrics that I used in this bag. It turned out wonderfully! I used to sew much more often, and your project just reminded me to pull my machine off of the shelf.